Bionic Briana: Chilled Cantaloupe + Mint Soup. 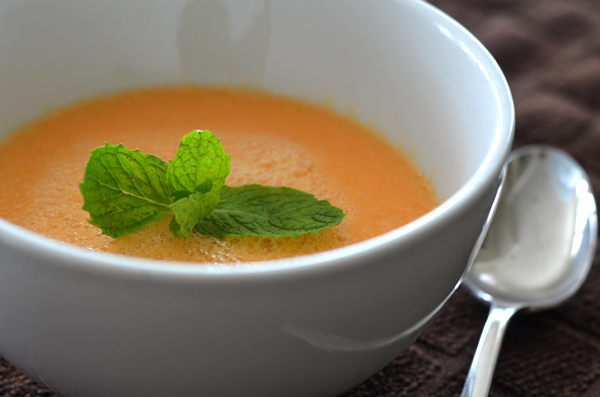 Chilled Cantaloupe + Mint Soup. Now that I usually have a squirmy toddler on my lap when flying, gone are the days of leisurely reading a magazine while on the plane. While flying home from Salt Lake earlier in the week, I improvised and got a little nosy, reading a magazine through the space between the airplane seats and over the shoulder of the woman sitting in front of me while Alice wiggled on my lap. Don't judge. It was a long flight! She was reading a variety of magazines but what was the most interesting read for me was an article in Health magazine dedicated to chilled soups. There were so many interesting ones but she was reading a bit too fast for me to take note of any of them except for this one. 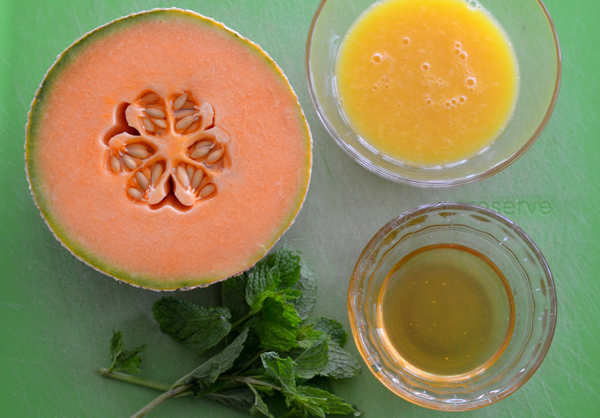 Chilled cantaloupe with mint soup! Luckily I had my iPhone at the ready and wrote down the very simple ingredients. And then a quick google search last night led me straight to the actual recipe. 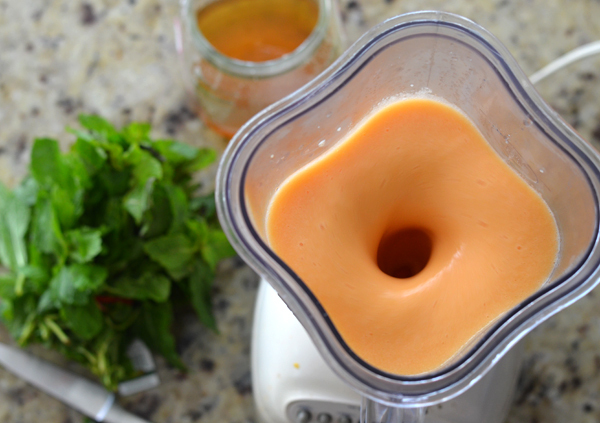 In a blender and working in small batches, add cantaloupe and orange juice. Add honey to desired sweetness. Blend until smooth. Prior to serving, blend for a few seconds and, with blender running on low, add finely chopped mint. Blend to incorporate. Pour into bowls and top with a mint sprig. Enjoy! We ate this "soup" for dessert last night and it was refreshingly sweet and, despite not having any dairy in it, remarkably creamy. And there was enough left over to freeze into popsicles for Alice. Since this kid never turns down anything sweet, I know she'll love them! P.S. Another simple and delicious summertime recipe using similar ingredients. Weekly workouts: Monday - My first visit to SLC Crossfit! Warm-up = 400m run, then 3 rounds of 10 wall squats + 10 medicine ball slams + 10 push-ups, then 5 rounds of squat snatches from 4 positions (55lbs), then 4 rounds for time of 25 goblet squats (35lbs) + 15 box jumps (20 inches) @ 7:58, THEN a half mile walk/run carrying two 35lbs kettle bells. That workout was NO JOKE! Tuesday & Wednesday - Rest + travel days. Thursday - Crossfit: 60 kettle bell snatches (26lbs) + 60 box jumps (20 inches) + 60 ab mat sit-ups (8:18). Friday - Crossfit: Bike to/from (3 miles), 4 sets of 8 good mornings (95lbs), 5 rounds for time of 3 power cleans (85lbs) + 15 wall balls (14lbs), 5:19. Salt Lakers are dead serious about Cross Fit! I have a few friends who Cross Fit and they love it! My co-worker is at a box downtown, not far from your condo. You are really dedicated to staying fit! Glad there was a place in SLC that you enjoyed going to. Mmmm chilled soup, what a great idea! I am always looking for easy recipes and this one sounds healthy AND delicious.